Burning an ISO or a NRG disk image to a CD or a DVD can be done easily with the help of CD/ a DVD burning software. There are many CD/DVD burning softwares available to be downloaded for free. A disk image contains all the files that are required to be burned on the CD/the DVD. There is no need to extract any files before burning it. The format of the image that is to be burned on the CD/ the DVD can be ISO, NRG, CCD, CUE, CDI, etc. When burning an ISO or the NRG disk image, the burning speed should be adjusted according to the recommended speed of the burner to avoid damage to the hardware, CD/DVD and other burning speed related problems. How to burn your ISO files? What softwares can be used? Should you extract the content of the ISO files before burning them? Here's how to get started. A disk image is a virtual representation of a CD (or DVD), ready to be burned. The image contains all the data to be recorded - so you can burn the image as it is! There is no need to extract its content using tools like Winzip or Daemon tools. Besides by extracting files from image, you may cause a bootable CD or DVD to stop working properly. ISO: the most common format is the international standard /contents/381-cd-cd-audio-and-cd-rom. MDS: Media Descriptor format used by Alcohol. NRG format Nero Image Editor. PDI format Instant CD / DVD. If the sums of integrity checks do not match exactly, do not proceed to the burning process. The checksum of the image must be identical to the one provided with the download link. If they do not match, try re-downloading the files. Then open your favorite burning software to select the "Burn a disc image" or "Burn ISO image" option. Burn an image with Nero: Tutorial. 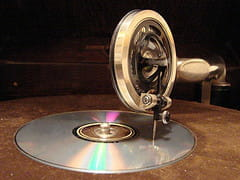 Burn a CD image . Burn a DVD image (ISO format ). Menu > File > Load a new image. Click on the Write Button. File > Write Disc from ISO File. Press the Browse button, and select an ISO image. An assistant wizard will be displayed. Then choose Burn ISO image. File > Create a CD from disk Image. Note that :this procedure remains the same for Easy CD Creator and Easy DVD Creator. Published by jad05. Latest update on November 14, 2013 at 09:44 AM by jak58. This document, titled "Burning a disk Image (ISO, NRG,)," is available under the Creative Commons license. Any copy, reuse, or modification of the content should be sufficiently credited to CCM (https://ccm.net/).